I’m almost ready to start working on my study area at home. I’m a planner and I have to write and draw and collect images to think out my plan. Reading area that’s comfortable, but not too comfortable. We’ll see if I can get my home study space to actually look like the images. I’m starting a doctoral program this fall. That means a lot of things at the moment. 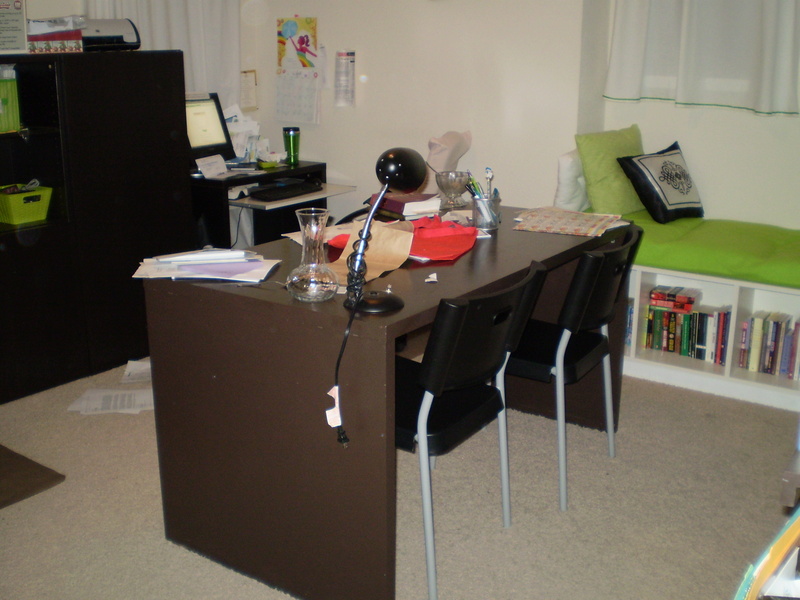 The one that is in the forefront of my mind is how to arrange my study space at home? Hubby and I have a loft that we have made into the office/computer area. There’s a large bookcase flanked by our desks and the bookcase also serves as a means of separating us so we’re not distracted by each other. In the middle of the room is a large desk/conference table that I used to spread out papers when I was a teacher or for large paper art projects. Behind the conference table lies another bookcase. I don’t think a huge overhaul of moving furniture about will work well…unless it’s flipping the direction of the conference table. Basically I want to carve out a space to study and do the mounds of research necessary for my studies. The program would supply me with a laptop and I would like to set my office up in the back part of the room. My big concern is distractions. If I study at the large conference table, will that be enough distance between me and my computer…the one filled with addictive games, emails and blogs. Thankfully, I have a plan B, well it’s more like a Plan A depending on the laptop and wi-fi access. I will convert the guest room closet into an office. The benefits would be much less distractions and the cat prefers to sit on the bed as opposed to the tiny space between my back and the chair. Hubby’s desk got a mini-remodel recently and the next step of the plan was to add a wide shelf on the wall to create a L-shaped desk so he can have some additional room to spread out as well. I created an additional space for hubby to spread his papers out on. Hopefully his will keep the banister clear from now on. By now you are aware that I love to shop from home and often start projects at random times-say chatting on the phone with a friend. 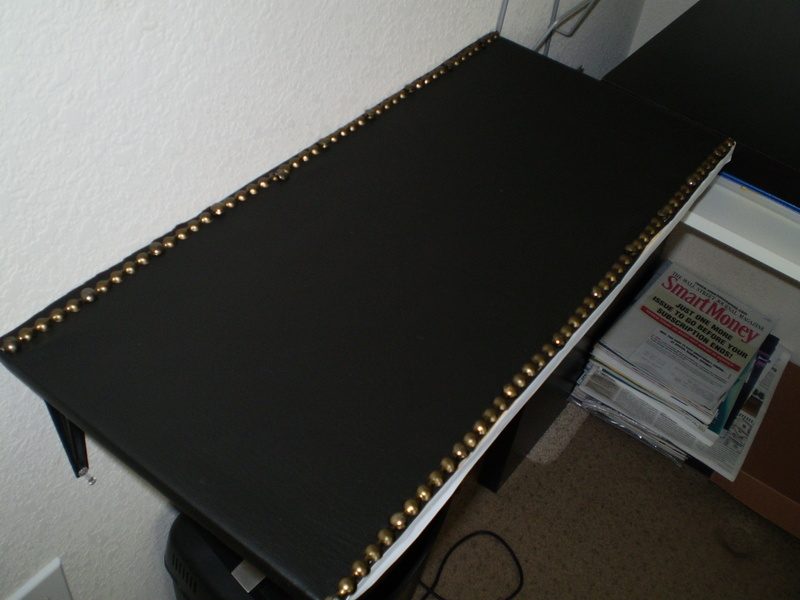 That’s how hubby got this mini desk remodel. His desk could have been considered organized chaos, I simply thought it was a mess. I hated how his paperwork ran over the banister, but this was because his desk was downsized from the large conference table to the tiny computer desk. In an effort to give him more space, I took a shelf off the wall and placed it above his desk. My initial thought was to go to IKEA and get matching boxes, but then I realized that we had plenty of storage boxes already at the house. The four boxes hold CDs, receipts, charity envelopes and headphones so the cat can’t chew them. The desk is finally free of dust and paper piles and there is room for his laptop to rest without pushing paper to the floor. The keyboard drawer holds two paper holders for misc papers and there’s room on the wall for temporary files. It took maybe 20 minutes to complete everything. The next step of the plan is to add a wide shelf on the wall to create a L-shaped desk so he can have some additional room to spread out as well. Wow, there are a lot of talented bloggers out there as evidenced by Living with Lindsay’s $5 Challenge. I spent days combing through all the entries. There was so much talent and simple awesomeness-I literally went awwweee, wooowww over quite of few projects. I got quite a few great ideas for our home that I wanted to showcase. 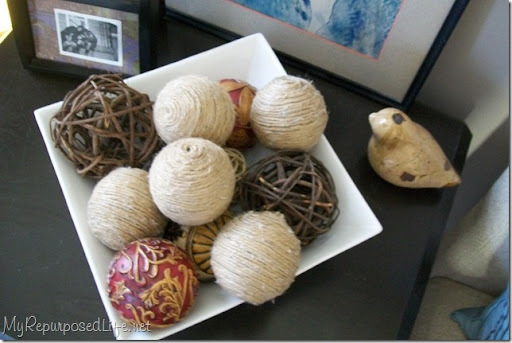 These are just a few of the projects that I thought would work in our home with our style. Clicking on the photos will take you to the tutorial for the project. 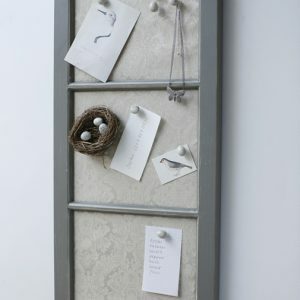 This is a cute way to keep track of things going on in the household. For our house, I would use a weekly calendar instead to display the lunch and dinner menu for the week. These plates are very cute and makes the perfect vintage modern decor item for a dining room. I can picture a series of these on our wall. Instead of birds, maybe cherry blossoms or damask patterns or even owls as homage to our university. This would also work as chargers for our dining room table since hubby and I eat off of salad plates in order to maintain the perfect size portions. This is the perfect place to stash cellphones. Hubby and I currently stash them on a small telephone table in the bedroom. 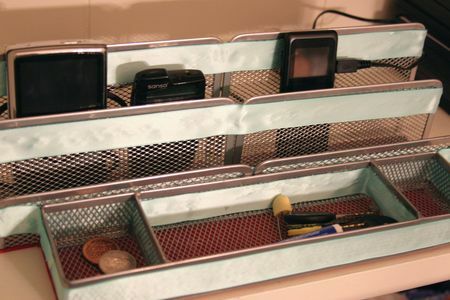 For our home, I would use only one of the file organizers and maybe add some wrapping paper or scrapbook paper over the mesh wire. Our bedroom is modern sensual luxe grey and taupe, but not that modern where the mesh would look good. I heart cherry blossoms and lovely plants as well. This one is even better as I can’t kill it! For our home, I would use solid colored rocks and maybe even add some cotton balls soaked in a pretty scent within the vase. The only hard part for us, is that since we live in a new subdivision, tree branches are hard to come by. I might ask a friend to save a few cute branches. I can imagine two of these rising tall on the dining room table. I’m craving fresh herbs and am counting down the days until I can pick up my herbs. I tried growing herbs from seeds, but I have more luck with seedlings. These painted pots are perfect for that purpose. This is perfect for when fall or winter makes it way back again. I can imagine a row of these during the chilly nights. How cute would this look with a miniature Christmas tree inside? Too cute. Once our family grows, I can see myself using this every single day. I also love the fact that you can change the background according to your every whim and desire. I’ve seen the cute vinyls, but I never thought to frame them out with trays like this. I have one of the vinyls called “Family” so for our house I would use that vinyl and either spray the trays bright white with black accents for a future stairwell project. This is also a great gift idea for a newlywed couple-which I have several coming up. 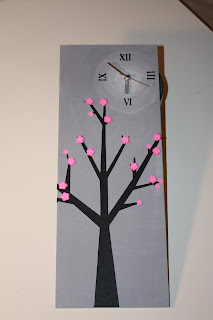 This is a very creative use of materials and I LOVE how she found the clock for $1 and decided to disassemble it. Why haven’t I thought to reserve a kitchen towel just to wipe my hands on. This is cute. For our home I would make at least two of those. One for by the sink and drying my hands after dishes and one for by the stove and drying my hands as I cook. I’d also add a blue or black ribbon as well to match the decor. This is also a great gift idea for those bridal showers that are sure to be starting sometime soon. I’m not the biggest fan of wreaths, maybe it’s the way that they lack clean streamlined lines and this irks with my brain to no end. There were plenty of great wreaths entered into the challenge, all very beautiful, most just wouldn’t work in my home. Except for this one. 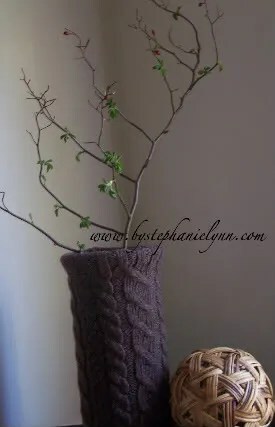 Especially if I used all white berry bushes for the front door, or laid this down as a centerpiece on the dining room table, or even placed it in front of the powder room’s mirror. Even better, this would be a very cute wedding detail on the church doors or hanging off the pews. Love both projects. 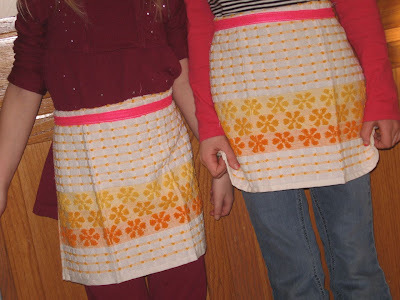 Since our baby is of the four-legged furry kind, I don’t think he’d appreciate wearing such a cute skirt, but I would take those placemats and make an apron with them. I have baskets and vases galore, but nothing to fill them, until I saw these beauties. For our home, I would paint them blue, silver, white and black and even cover some with wrapping paper, fabric, yarn and of course twine for added texture. These are both great toparies. The berry bush ones would look nicely on a centerpiece featuring the berry bush wreath, which the moss ones would look great in a bath room. For our house, I would paint the pots a solid color and maybe add a piece of ribbon to them. The powder room needs some accessories and I love the frugal nature of these. Make sure you visit Living with Lindsay’s $5 Challenge and browse through the hundreds of entries. What challenge? Living with Lindsay challenged readers to create new Spring decor for their homes using only $5 worth of products from the Dollar Store. The dollar store is my best friend, it’s my addiction, I can spend hours there browsing the aisles, digging through merchandise to find the perfect item. I decided to create a cute message board for my craft room. I’ve been itching to add some glam to the room and make it a bit more unabashedly girly. This was step one. I found some thick framed memo boards, cute silver stand (they were actually the same ones I used for my wedding’s photo table) and white grosgrain ribbon. 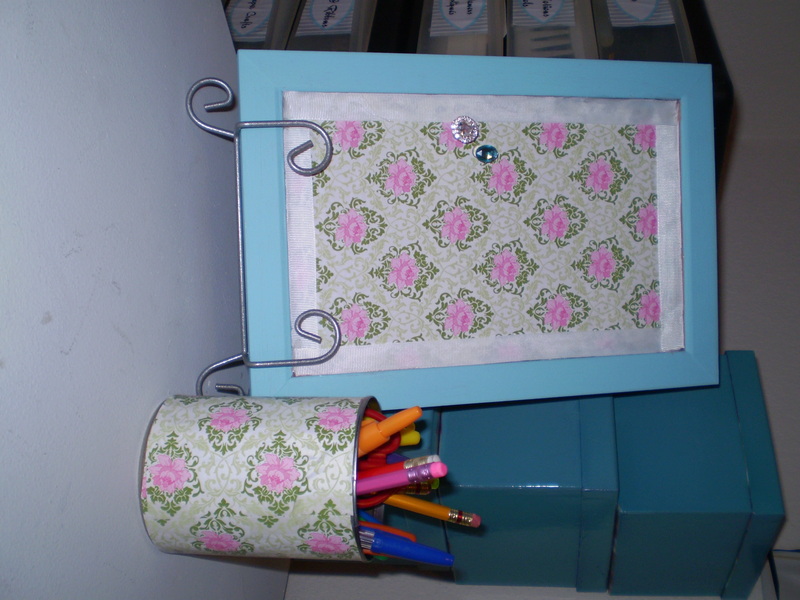 I pulled out some cute girly wrapping paper and aqua paint from the craft room. You can guess what I did next. 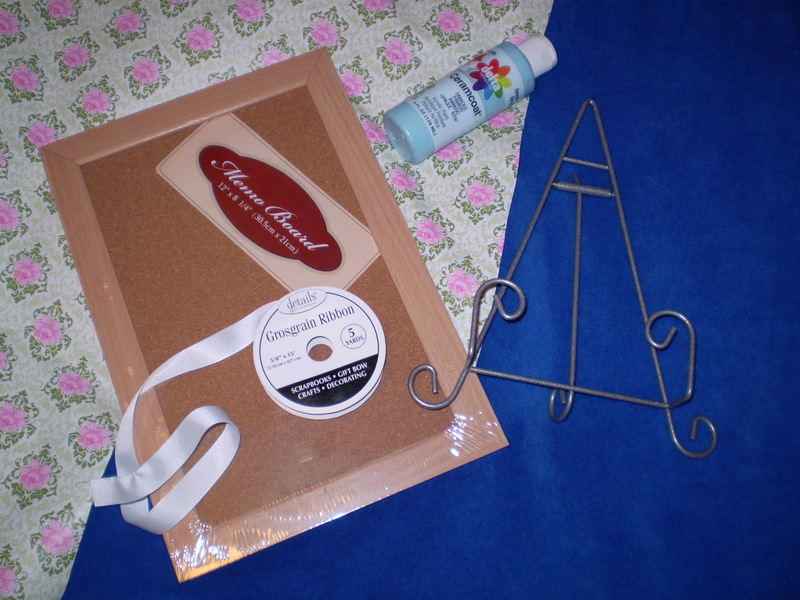 I painted the wooden frame aqua, pasted the wrapping paper over the cork and trimmed it all out in white ribbon. Instead of attaching it to the wall, I set it in the stand for a little sense of luxury. It looks so cute on my white desk. For bonus points, I decided to create an entire set that would include a pencil holder, glam push pins and a tray to hold supplies of works in progress. Even if you include the materials for the rest of the project, it would still come out to be less than $5. However, I used a repurposed can and I’m not sure if that complies with the rules. Using an old vegetable can, I recovered it with the same wrapping paper and added my colorful sharpies and paper scissors. 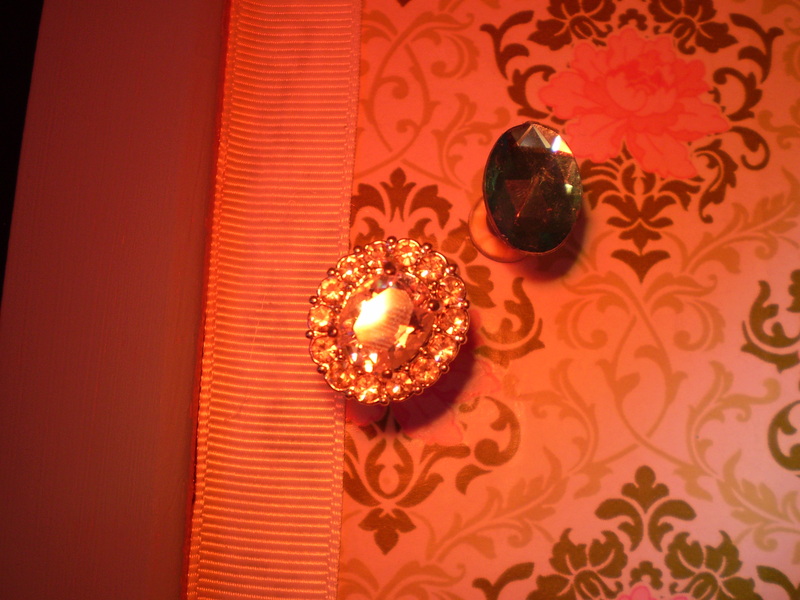 Using some old flat jewels, I glued these to the push pins for some glam office supplies. 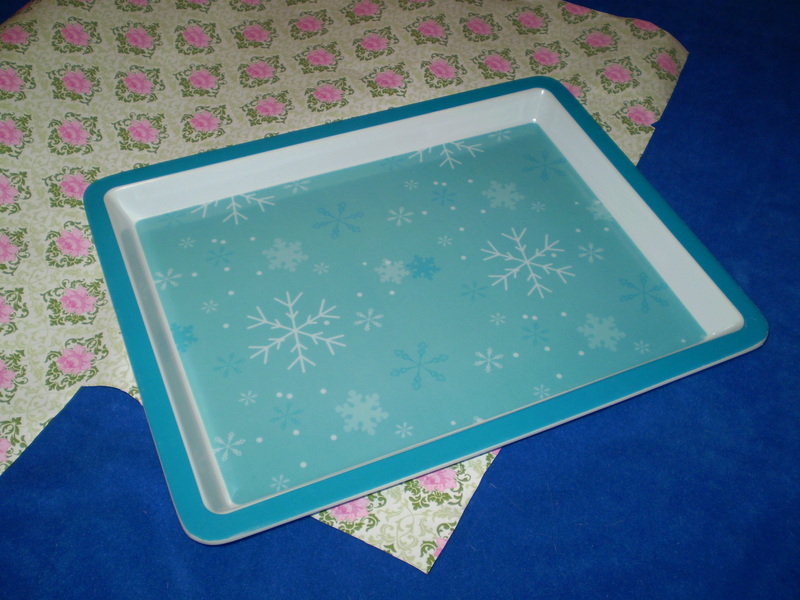 Finally, using a Christmas tray from the dollar store, I painted the edges with the same aqua paint and added the wrapping paper to the center. Isn’t it the cutest girliest office set ever? If I were to create another set, it would be a good gift for a teenager or college freshman. Especially if the paper were in their school’s colors and logo. I mentioned earlier that I was given the opportunity to help a friend convert a bedroom into an office. The first thing I asked was for her to list what she wanted the space to do for her. She had some goals of what the finished space would enable her to do, so I used those goals as well when I was designing. Hire a marketing intern to take charge of the marketing for the company. Have a system where coaches can get their own supplies. The room has a large set of hanging rods as a makeshift closet, two large windows and a set of bi-fold doors. 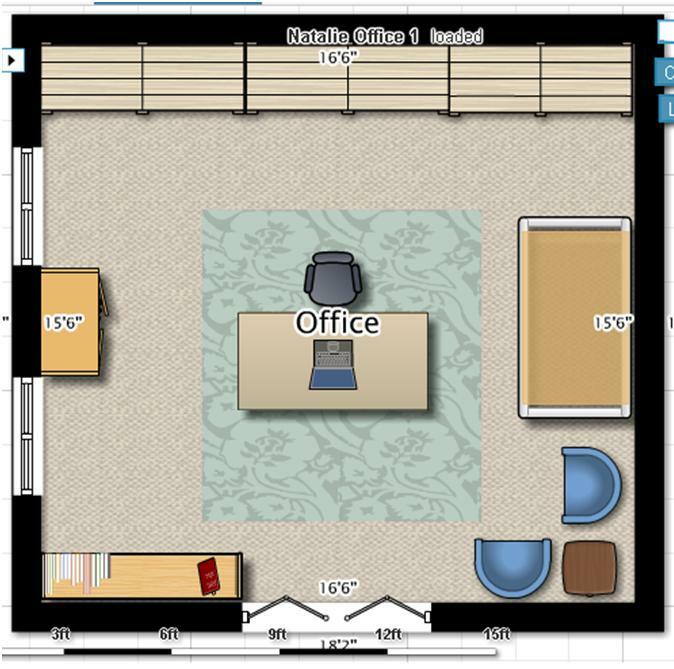 To help me with the design, I broke the office into zones. Equipment Warehouse: Storage of equipment for her company. Organized so coaches can retrieve items and put them back without her moving from her desk. 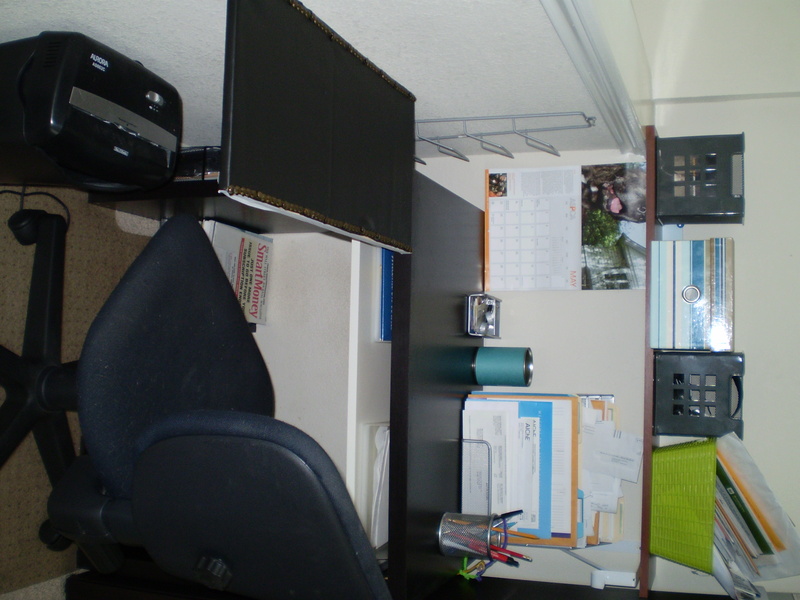 Administrative Office: Space to manage the company. Room for a laptop, calendar, active files. File Storage: Storage for company files and marketing materials. Conversation Area: Space to chat with coaches or take a break. I was able to come up with three designs fairly quickly. 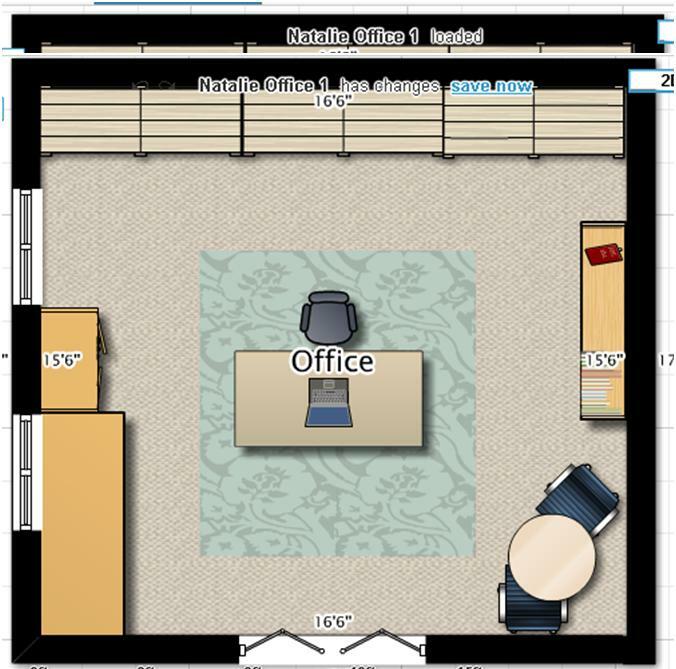 Option 1 puts the Administrative Office Zone in the middle of the room. 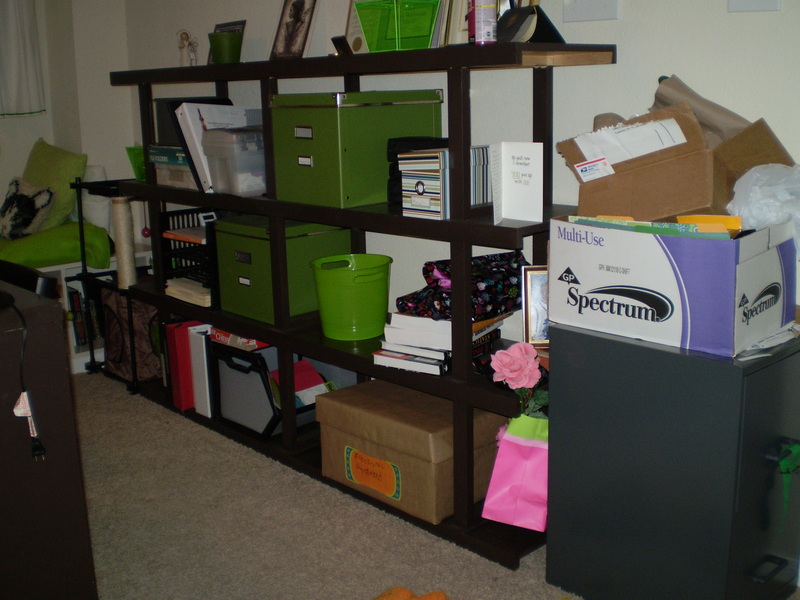 File cabinets can sit underneath the desk for immediate files and payroll. An armoire is between the windows. This armoire would hold scrapbook supplies. On the other side of the room the table can be used for those big scrapbook projects, or children’s ministry. There’s a seating area by the door for talks with clients and coaches. The chairs work double duty at the scrapbook table. A bookcase near the door will hold marketing supplies so the future marketing intern will be able to access things easily. The bookcase will also hold long-term files, like tax records, in plastic containers. The closet in the back would serve as the warehouse for company. Shelves would be added to hold plastic containers and bags will be hung from the rod. The closet will be hidden with a tension rod with blue fabric. Coaches would then be able to get supplies without assistance. 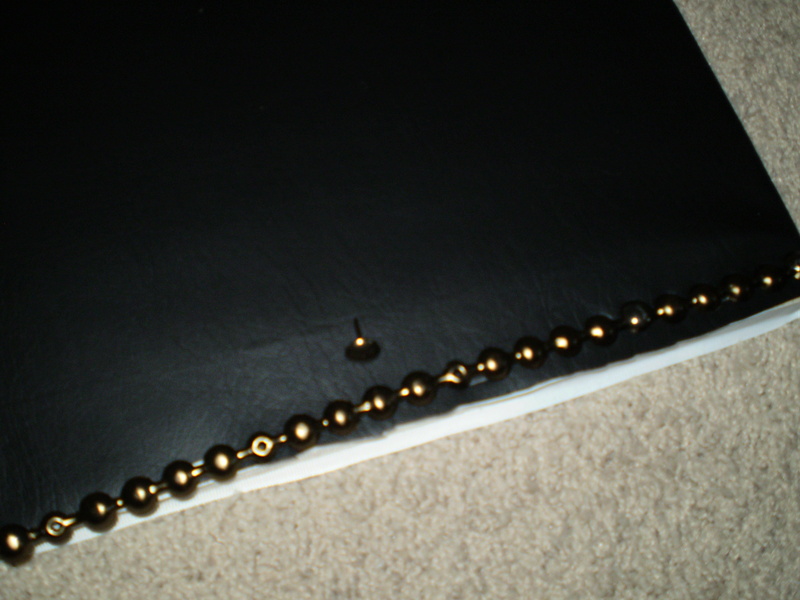 Coaches would also be able to use the nearby scrapbook table to gather their materials before leaving. 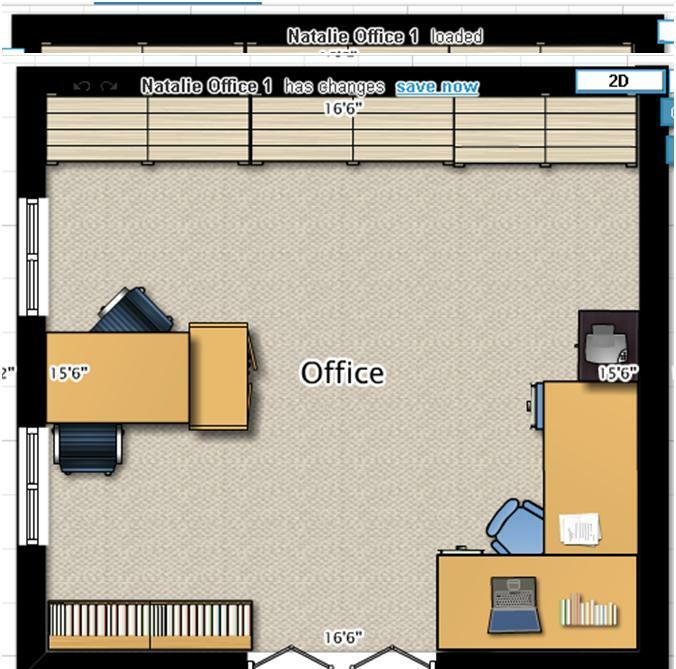 Option 2 keeps the Administrative Office Zone in the middle of the room. 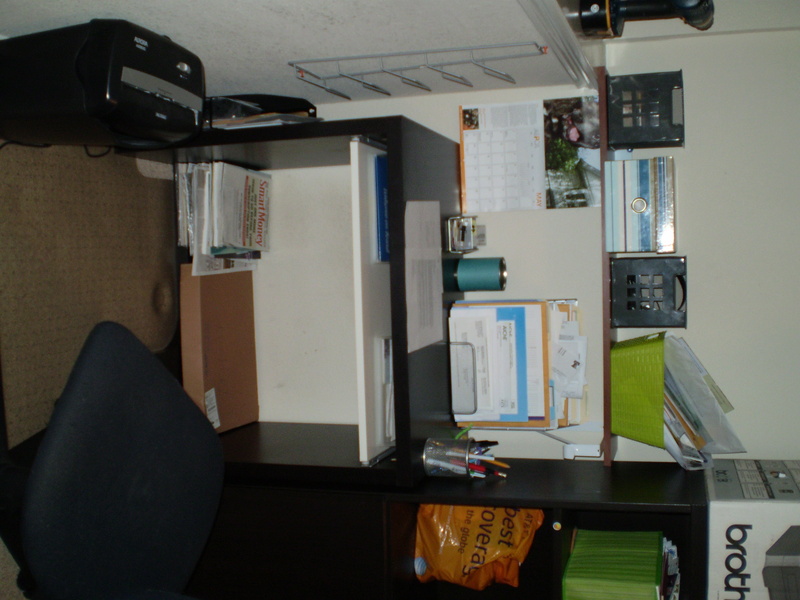 Again, file cabinets can sit underneath the desk for immediate files and payroll. An armoire is between the windows. This armoire would hold scrapbook supplies. 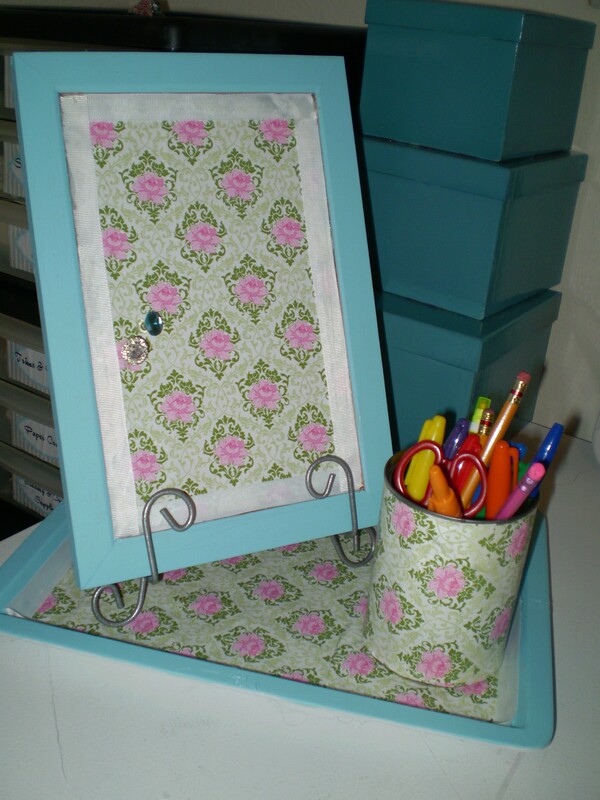 Next to the armoire is a table to be used for those big scrapbook projects, or children’s ministry. There’s a seating area by the door for talks with clients and coaches. The chairs again work double duty at the scrapbook table. A bookcase on the other side of the room will hold marketing supplies so the future marketing intern will be able to access things easily. The bookcase will also hold long-term files, like tax records, in plastic containers. Again, the closet in the back would serve as the warehouse for company. Shelves would be added to hold plastic containers and bags will be hung from the rod. The closet will be hidden with a tension rod with blue fabric. Coaches would then be able to get supplies without assistance. Option 3 moves the Administrative Office Zone to the corner by the door. 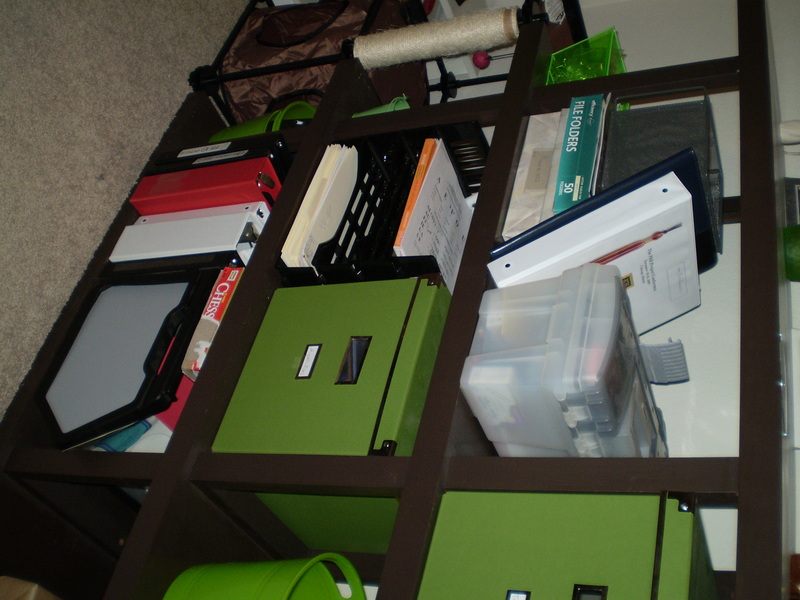 Again, file cabinets can sit underneath the desk for immediate files and payroll. 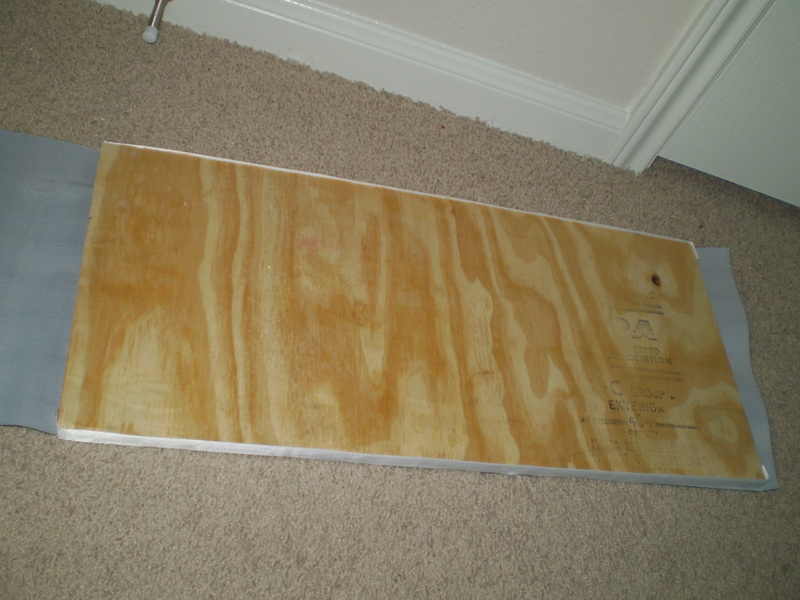 The walls can then be used for bulletin boards and dry erase boards and be within reach. Printer, fax, etc are also near this desk area. 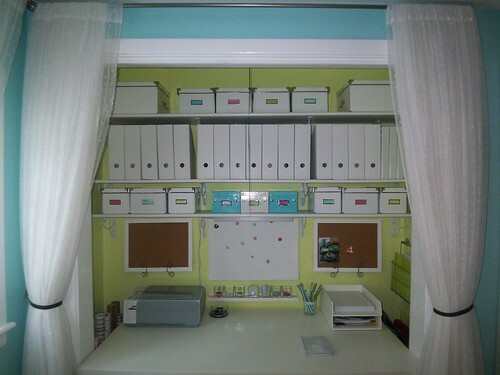 The scrapbook area is bewteen the windows with the armoire on the other side of the table. The seating area is shared with the scrapbook table, so no need to move chairs back and forth for those talks with clients and coaches. A bookcase by the door will hold marketing supplies so the future marketing intern will be able to access things easily. The bookcase will also hold long-term files, like tax records, in plastic containers. Again, the closet in the back would serve as the warehouse for company. Shelves would be added to hold plastic containers and bags will be hung from the rod. The closet will be hidden with a tension rod with blue fabric. Coaches would then be able to get supplies without assistance and be able to use the nearby scrapbook table to gather their materials. She has all three options, so we’ll see which one-if any-she picks. Since she is going to be dealing with several projects that will span several months (children’s ministry camps, trainings for the company, company camps, class schedules, etc ), she will probably need a way to see her progress on all these projects and make plans across several months. 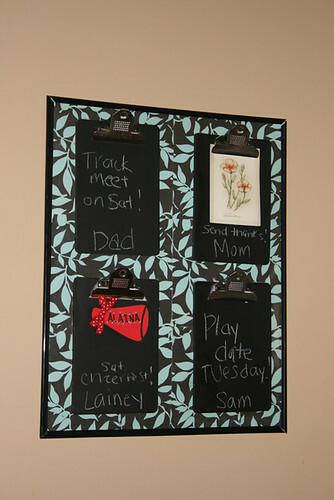 On a blank wall, there can be a display of large laminated calendars (one for each month) so that she can make notes on her progress and plans and be able to see them at a glance. 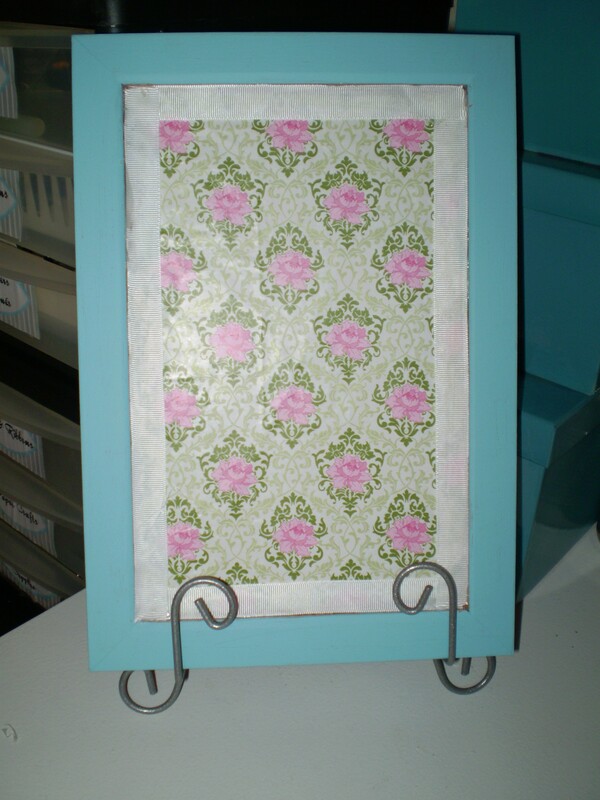 If done with scrapbook paper, then it can also be an art display. Scribble on Everything actually has a set of wall decals for this purpose. Once all the company’s equipment is inventoried, labeled and put away, she can place a clipboard hanging by the “warehouse” so coaches can sign equipment in and out. This process will free up more time for her, such that a coach can come to the office, she can continue to work on something else and they can serve themselves. The good thing is that the coaches will also be able to put objects back themselves since everything is labeled and organized. With everything cleared and stored out-of-the-way, she could potentially use the office to hold trainings with the coaches and staff meetings as well. For classes, push the furniture against the wall temporarily, for staff meetings, simply pull in more seating which can be in the form of storage ottomans, that way they serve double duty.